“Major concerns exist in the southern Caribbean, including from northern Guyana to Barbados and west to the ABC Islands (Aruba, Bonaire and Curacao) for short term drought that can impact small rivers, streams and ponds, by the end of April 2019,” announced CariCOF in its February issue of the Caribbean Drought Bulletin, released here, today. It said that significant concerns also exist, over long term drought that can impact large rivers and reservoirs, and groundwater by the end of May 2019, in parts of the eastern Caribbean, Jamaica, Hispaniola and southern French Guiana. “In any case, the entire Caribbean basin should closely monitor water supplies for the next few months,” it advised, warning that rainfall has been normal, to below normal, for the islands of the eastern Caribbean. According to CariCOF, Trinidad was moderate to exceptionally dry, while Tobago was moderately dry; Grenada, St. Lucia and St. Kitts was normal; Barbados, Antigua and St. Maarten registered slight to moderately dry; St. Vincent, normal to slightly dry; and Martinique, Dominica and Guadeloupe recorded normal to moderately dry climate. 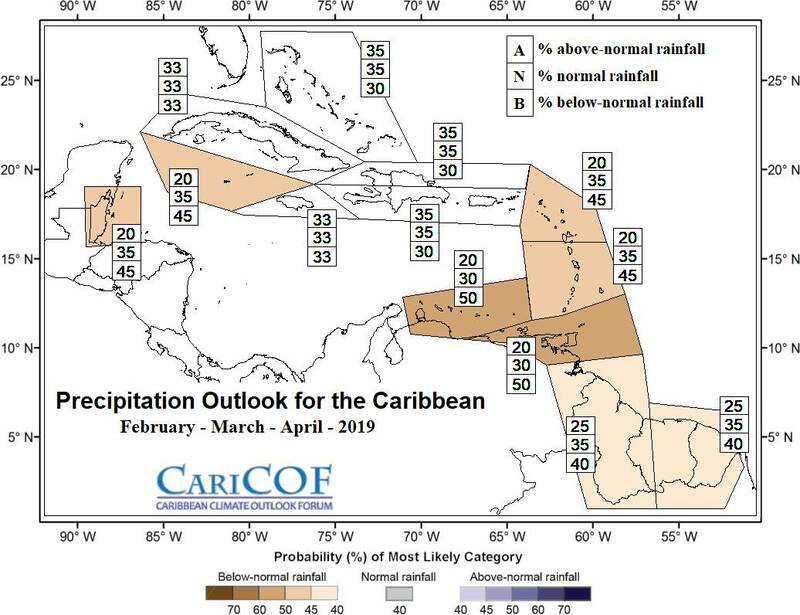 CariCOF said conditions in the Guianas ranged from severely dry in northern Guyana, to very wet in eastern French Guiana, and with most of Suriname being normal. “Jamaica was moderately wet in the south, to slightly dry in the west and east, but Grand Cayman was normal. Western Cuba was normal to moderately wet and eastern Cuba normal to severely dry; but northern Bahamas was normal to moderately wet. Belize ranged from severely dry in the west, to normal in the north,” CariCOF said in the bulletin. Regarding the current drought situation, CariCOf said that portions of the Bahamas, Barbados, Belize, Cayman Islands, Guadeloupe, Guyana, Hispaniola, Jamaica, Martinique, St. Barths, Trinidad and the US Caribbean territories have seen shorter-term drought developing. With moderate, long term drought being recorded in much of the Antilles, and even severe to extreme droughts in small pockets of Guadeloupe, Hispaniola and Martinique,. A shorter-term drought situation, by the end of April 2019, is evolving in the ABC Islands, Barbados, Grenada, Trinidad and Tobago, while shorter-term drought might possibly develop in Antigua, Southern and Central Belize, Cayman, French Guiana, Guyana, Hispaniola, Martinique, Puerto Rico, St. Kitts, St. Vincent and Suriname. CariCOF said, regarding long term drought situation, by end of May, a weak El Nino is expected to contribute to reduced rainfall until April. And that long-term drought is evolving in Antigua, Cayman, Cuba, Dominican Republic, Grenada, Martinique, Puerto Rico and Tobago.